Last Friday was Buddha's birthday and a public holiday (thanks Buddha). Jihyeon and I traveled to Gyeongju national park and Gyeongju city where there is a heavy concentration of historical sites such as tombs, temples, statues and various other relics of the past. Gyeongju (travel directions here) is in the far south eastern corner of South Korea and it took about 3 hours to reach the Bulguksa temple from Daejeon. Since it was a public holiday AND Buddha's birthday the train was packed! We could only buy standing tickets on the KTX (all the seats were booked) even though we booked two weeks early! Once we arrived at Singyeongju station (the KTX station nearest Gyeongju City) we then had to catch the number 700 bus to get to Bulguksa temple (which is the last stop for the number 700 bus). The bus was packed. We managed to squeeze on (there were no seats left) for the 1hour 20 minute bus trip to the temple. The temple is a short walk up the hill from the bus stop. The construction of the temple was started in 751 and completed in 774 and served as the center of Silla Buddhism. The entire temple was burnt down (thanks Japan...) in 1593 because it was used as a base for the volunteer militia. Though the main hall and a few other principal buildings were rebuilt, it was not until 1969-73 that it was completely restored. After walking through the main gate (pictured above) we then encountered another gateway which housed 4 guardian statues called Sacheonwang which roughly translates to "kings of the sky" or "four heavenly guardians of Buddhism". It was their job to protect the 4 ways (North, South, East and West). A little further along the path, and we came to the main temple. As you can see, there were lanterns everywhere. According to Buddhist beliefs, lanterns symbolize wisdom in that they bring light into the world. Decorating the whole temple with these lanterns is an important ritual in Buddhism to give respect to Buddha. That said, I found them to be incredibly annoying. They were everywhere and often hanging way too low to walk under (where is the wisdom in that?). I may have appreciated them more if they had all been carefully hand made and each one was unique, but that wasn't the case. They were all the same (apart from the colour) and mass produced in a factory somewhere from plastic. This picture was taken inside the courtyard. To the left of the picture is the main temple (Daeungjeon) which is home to a large Buddha and to the right is the pagoda called Dabotap. Photos are prohibited inside the temples, but I was able to find a picture on Google that I have included below. The Dabotap pergoda is national treasure number 20 of South Korea and was built in 751. I am told that it stands 10.4 meters high and was built in an ornate style not seen in other Buddhist countries. There were originally 4 stone lions (one on each side), but now only one remains. One of the lions is located at the British Museum in London, but the whereabouts of the other two is unknown (*cough*, Japan). Staircase (decorated with lanterns.....) to a different section of the temple complex. Around the next temple were thousands of stones stacked on top of each other. The idea is that you make a wish and put one stone on top of another. As you can see in time they grow tall as different people come along and make a wish. Random photo of me posing next to a bridge. Once we finished walking around the temple we decided to climb the mountain to see visit the Seokguram grotto. It was only 2.2km, but the hill was bloody steep and it felt like much further. If you don't want to hike up the hill, you can go back to the bus stop and catch a bus (the number 12) to the top of the hill). In Australia Jihyeon was a little shocked when I told her that when you go hiking in Australia there is no guarantee there will be a toilet so you need to be prepared to go bush. I had a chuckle when I saw this. We were half way up the side of a mountain in dense thick forest and what do we find? The rolls royce of toilets, built of brick and concrete it was complete with electric sliding doors, hand driers, flushing toilets, hot water and even a small room for, what I assume assume, cleaners to chill out in when they were not busy cleaning. Half way there, 1km to go. We took a 100m detour off to the right to see the mineral water spring (Yaksuteo). Once there I filled my water bottle. We kept climbing the mountain and eventually reached reached the summit. We could hear the giant bell getting rung long before we could see it. Pictured here is the building that houses the bell. And here is the giant bell. It cost 1000 won (about AU$1) to ring the bell. And some glamour shots with the bell and my hairy arm. The view from the bell building (what is the structure called? I want to call it a bell tower, but it isn't a tower). We continued on (about another kilometer, but thankfully it was flat) to Seokguram grotto. Along the way I spotted this little guy at the edge of the path. We finally reached the Seokguram grotto. It was first constructed by Prime Minister Gim Dae-seong in 751 and was originally called Seokbulsa. As you can see in the diagram below, the grotto has a rectangular antechamber and a round main hall. 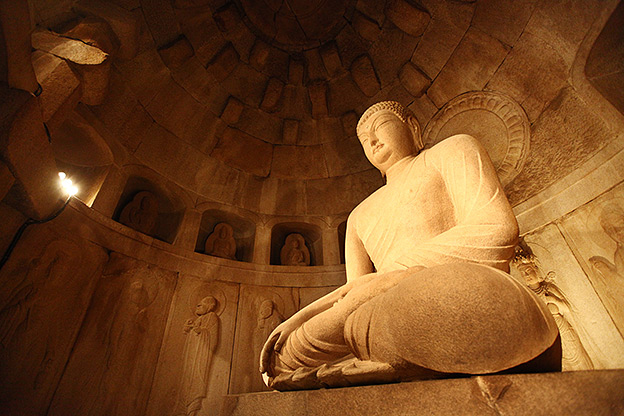 In the rotunda hall sits a large Buddha carved in granite. According to the Samgukyusa, Gim Dae-seong founded Seokguram for the parents of his previous life. 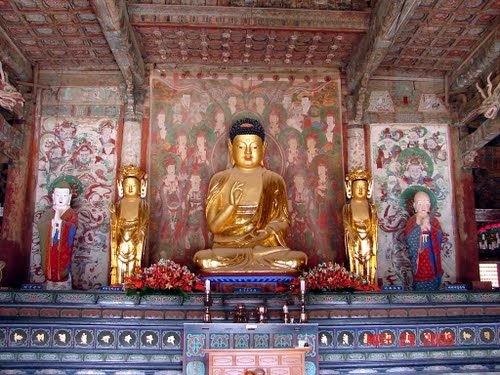 Seokguram represents not only the supremacy of Silla arts, but also is regarded as the best oriental Buddhist work. Since it was Buddha's birthday there were people everywhere. There was a huge queue of people waiting to get into the grotto. And (as is often the case in Korea) you need to take your shoes off before you can go in. Normally you can't go all the way in. There is a large glass window you have to look through. But, since it was his birthday, we were allowed all the way in. I should note that photography was not allowed inside. I shamelessly stole the pictures above from Google image search. I am not sure on the exact details, but the Japanese knocked down part of the grotto. When it was rebuilt, these stones were left over. No one was sure where they were meant to go. Nice to know I'm not the only person who has parts left over when I reassemble things :). Here they were selling writing space on roof tiles to help raise money. People were writing their wishes on the tiles which will be used in various construction projects around the temple. We then started to make out way towards our accommodation for the night. Jihyeon called the owner to get some directions on where we exactly needed to go. He instructed us to start walking down the hill along the edge of the road until we reached a spring. We took one look at at the narrow winding road and the heavy traffic and decided it was a bad idea, especially since we didn't know exactly how far down the mountain the spring was. So.... we did the sensible thing and used a taxi. We gave the taxi driver the address of the accommodation and off we went. About 20 minutes later we arrived..... in the middle of nowhere. The taxi driver phoned the owner of where we would be staying, and proceeded to shout at him for a good few minutes before doing a U turn (while still talking on the phone and shouting) and proceeded to drive back the way we came. It turns out the GPS was wrong and we had to back track for about 15 minutes to reach the driveway to our accommodation (which was 950 meters long). The owner came and picked us up in his lovely truck (charged us 3000 won). He had built some rooms off to the side of his home for guests to stay in. This is out the front. And this is inside. I actually thought the ceiling was quite interesting. It looks like he just chopped down local trees. I was impressed..... for a moment. This was our room. It was very small (which was fine since we were only sleeping there one night), but the floor was not as clean as it could have been, and the bed was dirty. There is also no sound proofing and you can hear people quietly talking quite clearly from the room next door. I looked up to see his dodgy DIY wiring for the lights. I then decided to check out what the bathroom was like. I had to step through a very small door off to one side of the main common room. And this was the bathroom. I then decided to step outside and get some fresh air. On my way out I spotted this nifty locking mechanism. And this was the view from out the front. Trees, trees everywhere. To give you an idea of the detour the taxi took us on, we actually drove well past those wind turbines you can see in the distance here. It was a very long day for us both. We had traveled all the way from Daejeon (Jihyeon even further from Iksan) and been on our feet all day, so we opted to have dinner at the accommodation. Not the best idea of the day. No meat, just rice and kimchi soup, lettuce, bean paste and seaweed paper. He charged us 6000 won..... each! The website for where we stayed can be found here http://www.hyangjun.com/. I would not recommend staying there. I am still trying to recover from the terrible nights sleep I got there. EDIT: I just finished. You can read about our Saturday adventure here. Please tell me the name of the historical document i.e. primary source that described Japanese troops destroyed Bulgkusa temple. I've been searching Japanese, Korean and Chinese documents so hard for my study but I can't find anything like that. I've read the explanations about the history in many places on the net, but none of them has the citation. Could you help me? I don't know. I am not a history major. That particular fact was written on an information plaque at the temple. But given that Japan invaded Korea at that time it seems entirely reasonable that they burn it down when they found out it was the base for the resistance to their occupation. I'd suggest finding a Korean historical society and asking them for assistance. Thank you very much for response, Phillip S.
I've once sent a message to UNESCO to ask for the primary source the description on their website was thought to be based on, but I've never gotten a response from them. Probably, they were based on Koreans' claim. Instead of the description of Japanese destroying the temple, I found a Korean document that described Koreans destroyed it by themselves under the policy "revere Confucianism, abolish Buddhism" during the Joseon Dynasty. It says the King Taejong ordered to destroy all temples except 88 temples in Korea and there's no Bulguksa Temple in those 88 temples written. Furthermore, in 1424, the era of the King Sejong, another 52 temples among those 88 temples were destroyed by his order, it says. Of course, Bulguksa isn't written in the list of 36 survived temples. It indicates Bulguksa was already destroyed when Hideyoshi's troops invaded Korea in 1592. What do you think of that? So.... when Koreans write a document stating that they burnt some of their temples it's a credible source, but when they say Japan did something bad it is no longer credible? You make it sound as though Koreans are trying to cover up the fact that they burnt down some of their temples. I've been to many temples where they openly stated on the information plaque that during a time of anti Buddhism in Korean the temple was burnt. Try finding an answer to the question "was the temple used as a resistance base during the Japanese invasion". You should be able to find corroborating documents from both Korea and Japan. Pretty sure that will pour water all over your conspiracy theory. There could be any number of reasons for the conflicting information you think you have found. Maybe the temple name changed? Maybe your Korean isn't as good as you think it is. Maybe the local community kept the fact that it wasn't destroyed a secret. Maybe there was a mix-up and the wrong temple was burnt. Maybe only 1 or 2 buildings were burnt by the Koreans and were later re-constructed. To be honest, I really don't know who to believe now. I searched documents and articles related to Bulguksa temple again, and I found an interesting photos. According to them, Japanese found Bulguksa and Seokguram Grotto and reconstructed both of them during the occupation period. It means they had been abandoned without being restored for over 300 years until they were discovered by the Japanese. But it makes sense because it's the fact abolishing Buddhism continued until 20c in Korea. 1. There's no document in the world, that describes so. 2. A Korean document describes Koreans destroyed them before Japanese invasion. 3. Japanese at the time were all devout Buddhists. Destroying Buddhist facilities are very sinful thing for superstitious Buddhists. 5. Japanese 'reconstructed' them during the occupation. 6. It's not the first time Koreans fabricate history. Correct. Japan did reconstruct SOME of the buildings during their occupation period prior to and during WW2. However, reconstruction was not completed until 1973. I don’t think anyone is denying that. Information plaques at the temple even state that the Japanese commenced the reconstruction efforts. Allow me to address each one of your assertions. 1) Really? You have read every document in the world. How about you go and look for documents about Buddhist resistance bases like I suggested you should do. I’m sure there are both Japanese and Korean documents which will corroborate the Korean Buddhist militant activities. 2) By your own admission, the name of the temple was not actually listed anywhere. 3) I’m pretty sure killing innocent people is a sinful thing for Buddhists too, but it didn’t stop the Japanese from committing war crimes and invading their neighbours. 4) Well, of course they left them destroyed. The country was one of the poorest countries in the world, in part thanks to Japan. I’m sure the Koreans were more concerned about feeding themselves than rebuilding temples. And leaving temples destroyed is not a sign that they were destroyed by Koreans, it is a sign of changing religious beliefs within Korea. 5) so… because they partially reconstructed them during the occupation in the early 1900’s, that means they couldn’t have burnt them to the ground 300 years earlier when a militia of Korean Buddhist monks used the temple as a base for their operations. 6) This just comes off as a racial slur and to be frank it is offensive. I challenge you to name one country that has not put their own twist on historical events. If you want to rely on racist logic that’s fine, but you are not fooling anyone. At least, not anyone with half an idea. You are as bad as people who think the moon landing was faked. 1. I collected documents referring to anything about Imjin war for my study. Both Korea and Japan recorded it well in detail, but there's no description Japanese troops destroyed them. You can't find what doesn't exist, right? Why doesn't the description about Bulguksa history on Wikipedia have the citation? It's much easier they give the primary source they were based on. Is there any reason they don't? 2. Not being listed on the document means it wasn't survived, but destroyed just like other temples. 3. I understand your point. But any other religions, Christian or Muslim, also don't allow destroying their sacred places even though they allow killing people. 4. What do you mean by "in part thanks to Japan"? 5. Exactly. The reconstruction in 20c doesn't prove that the Japanese didn't destroyed them in 16c. 6. How come pointing out their lies and fabrications is offensive? Those acts ARE offensive and insulting to foreign countries, aren't they? I think it's not good for the nation itself too. 1. Well good on you. Type up your findings and send them to UNESCO and let them decide. UNESCO doesn’t just slap their stamp of approval on just anything, so until the information on their website changes I’m going to continue to believe that the Japanese did in-fact burn down the temple at a time when they were burning many buildings to try and demoralise and strike fear into the Korean people. 2. Not being listed doesn’t mean jack. As I said. Maybe the local people kept the fact it was't burnt a secret. Or maybe they only burnt 1 or 2 buildings but left most of it intact which is why it was listed the way it was. 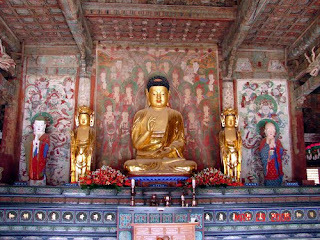 It wouldn’t be the first time a Korean military person refused to destroy a Korean Buddhist temple (see Haeinsa temple). By not giving the king a list of temples that were destroyed, technically they weren’t lying to the king. 3. Let’s get one thing straight. Religions don’t allow the killing of innocent people. Some people use religion as a tool to manipulate those that follow that religion for the purpose of executing their own agenda in the name of that religion. As far as not destroying churches goes... HA. Plenty of churches were destroyed by the American and British (societies built on Christian values) during WW1 and WW2. 4. Well, last time I checked Japan was there for the greatness of the Japanese empire, not for the good of the Korean people. Take a look at any country that gets invaded by a foreign power, has their wealth stripped, and the culture crushed. The result is chaos and decades (sometimes centuries) of poverty. 5. Exactly, so why put it forward as evidence for your argument? 6. Why is it offensive? Because you are using past lies to justify your assertion that the Japanese did not destroy the temple. Let the evidence on Bulguksa speak for itself. No need to resort to racial slurs. It’s pathetic. I could quite easily make the same argument about Japan. They lie and cover up the reasons for whaling and say they are doing scientific research when it is obvious to anyone with half a brain that they are not. Therefore, they did the same thing 400 years ago at Bulguksa..... but I won't do that because I don't need to resort to racial slurs to make an argument. Please stop trying to post comments on my blog. I've moderated your recent comments into oblivion because of your insistence on putting forward your racist opinion to support your claim. Calling an entire ethnic group of people liars and implying that you can't believe ANYTHING they say because of their ethnicity is racist. I've got better things to do with my time than poke holes in your flimsy arguments about what Japan did or didn't do when they repeatedly invaded Korea. Anonymous, looks Japanese. Japanese colonial era, Japan temple is created 500. After independence, there is only one. This is not reconstructed. It is adapted to change. They remove all, we were newly designed. According to Koyto University, Seokgulam repair report. Terauchi Masatake, attempts to transfer it to Japan. Failure. They change, newly designed. 1961 was again restored in South Korea, but it will fail.